Imagine having a chainsaw on the end of a long stick. How cool would that be? Well, that’s essentially what WORX has created with the release of its brand-new, ingeniously designed 2-in-1 Pole Saw (Model WG323). This versatile tool consists of an adjustable, telescopic shaft that’s fitted with a 10-in. chainsaw. 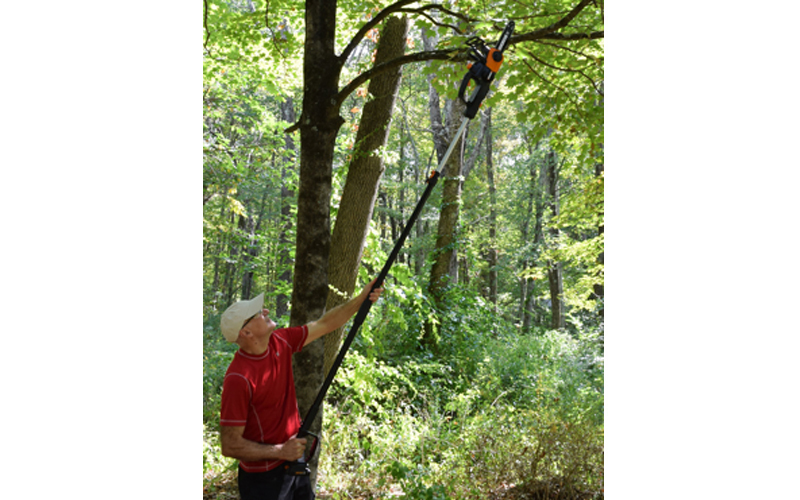 The shaft is extendable to 10 ft., providing homeowners with a very safe and easy way to reach high into trees to trim branches. And, if that weren’t cool enough, you can also disconnect the chainsaw from the shaft and use it to cut up fallen branches and slice logs into firewood. The saw is powered by a 20-volt rechargeable battery, allowing you the freedom to cut anywhere on your property without messing around with extension cords or mixing oil and gas. The telescopic shaft is made from resilient, impact-resistant composite plastic that easily supports the weight of the 10-lb. chainsaw. And adjusting the length of the shaft couldn’t be simpler: A single lever securely locks the shaft at the desired length, and an internal spring-steel reel automatically and conveniently retracts the shaft when the lever is unlocked. The chainsaw slides onto the end of the shaft and is secured by tightening a large, easy-grip locking knob. The compact, 10-in. WORX chainsaw boasts all the user-friendly features and safety mechanisms you’d expect to find on any chainsaw, including instant oil lubrication, automatic chain-tensioning system, front hand guard, low-kickback saw chain, and over-molded hand grips. The WORX 2-in-1 Pole Saw retails for about $150, and comes ready-to-cut with a 20-volt lithium-ion battery, plug-in battery charger, and slip-on plastic chain-bar protector. For more information about the 20V 10″ Cordless Pole/Chain Saw go here. For more information about innovative tools from WORX please visit www.worx.com. Love your tools , have many of them… on this battery operated chainsaw.. please make a 32-volt model.. so as we can use the the max 32Volt battery system.. ..
How long does it run one charge? I really like my 10in electric pole and wanted to get one of your bigger 14in or 16 in but was told , they wouldn’t work with my pole. But you don’t make a pole for bigger saws.why not?